Covered in multimedia lecture #2112. There are several reasons why the Renaissance came later to Northern Europe. First, it was further removed from the centers of trade and culture in the Mediterranean. As a result, towns, trade, and the more progressive ideas that tend to come with wealth developed more slowly in the north. Along these lines, the greater influence of feudalism and the Church kept the political, social, and intellectual institutions much more medieval and backward. This in turn provided more resistance to the humanistic ideas developing in Italy. However, the revival of towns and trade in the North combined with other factors in three ways to bring the Renaissance to Northern Europe. First of all, the urban revival in the North along with the Portuguese and Spanish overseas colonies created the financial resources needed to patronize the arts. Secondly, growing trade in the North, combined with the French invasion of Italy in 1494 and the ability of the printing press to spread ideas quickly and accurately, led to growing contact with the ideas of the Italian Renaissance. Finally, the rise of towns together with the rising national monarchies in France, England, Spain, and Portugal led to the decline of the feudal nobility and medieval Church. This created less resistance to the new ideas from the Renaissance. 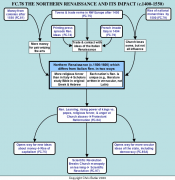 All these factors came together to produce the Northern Renaissance (c.1500-1600). The Northern Renaissance should not be seen as a mere copycat of the Italian Renaissance. There were two major differences between the two cultural movements in Italy and the North. First of all, the Church's influence, despite being shaken by recent corruption and scandals, still was strong enough to make the Northern Renaissance more religious in nature. Second, the rising power of the national monarchies made the Northern Renaissance more nationalistic in character. The more intense religious feelings prevailing in Northern Europe posed a difficult question: could a humanist education based on classical culture be reconciled with Christianity? The answer humanists came up with was yes. This was largely thanks to the greatest humanist of the age: Erasmus of Rotterdam (1466-1536). Called the "Prince of Humanists" and the "scholar of Europe", Erasmus dominated Northern Europe's culture in a way few, if any, other scholars have before or since his time. So great was his reputation that kings and princes from all over Europe competed for his services at their courts. Erasmus popularized classical civilization with his Adages, a collection of ancient proverbs with his own commentaries. His Praise of Folly satirized the follies and vices of the day, in particular those of the Church, while further popularizing humanism. Erasmus was still a pious Christian who pushed the idea that it was one's inner spirit, not outward shows of piety through empty rituals, that really mattered. However, he saw no contradictions between Christianity and ancient cultures. He underscored this attitude by referring to the ancient Greek philosopher, Socrates, as "Saint Socrates". Other northern humanists picked up this banner. In England, Thomas More brilliantly defended studying classical Greek and Roman culture by saying their knowledge and the study of the natural world could serve as a ladder to the study of the supernatural. Besides, he pointed out, even if theology were the sole aim of one's education, how could one truly know the scriptures without knowing Greek and Hebrew, their original languages? It was in this spirit that the French humanist, Lefebvre d'Etaples, laid five different Hebrew versions of the Book of Psalms side by side in order to get a better translation than the one in the Latin Vulgate Bible. Even in Spain, the most staunchly Christian country in Europe, Cardinal Ximenes, who served as virtual prime minister for Ferdinand and Isabella, set up a university at Alcala with a very humanist curriculum. Its purpose was to use humanism to provide better understanding of Christianity. The major accomplishment of Erasmus and the Northern humanists was that they successfully defended the study of the classics and a more secular education as a ladder to better understanding of Christianity. This in turn paved the way for using a secular education for more secular purposes and that would revolutionize Western Civilization. Art also reflected the more religious nature of the Northern Renaissance. Secular and even mythological themes would appear, but with less frequency then in Italy. This intense religious passion is especially reflected in the work of the Spanish artist, El Greco. Technically, art in the North lagged behind Italy throughout the 1400's, especially in its use of perspective and proportion. The key turning point came when the German artist, Albrecht Durer, traveled to Italy in 1494 to study its art. Durer was heavily influenced by the Italians and the ancient writer, Vitruvius, in their efforts to find the mathematical proportions for portraying the perfect figure. Among other things, this shows a growing fusion of art and science that anticipated the scientific revolution that would sweep Europe two centuries later. Other northern artists followed Durer, and from this time one sees a more realistic art in the North, which approached the standards of the Italian artists. The other major feature of the Northern Renaissance was the national character of the cultures that were evolving along with their respective nation-states in Europe. The literature of the age especially showed this. For one thing, it tended to be written in the vernacular and reflected its respective national cultures. In Spain the great literary genius was Cervantes, whose Don Quixote showed the changing values of the age by satirizing the medieval values of the nobility. Probably the greatest literary genius of the age was William Shakespeare, whose work reflects heavy influence from the Italian Renaissance. Many of his plays have Greek and Roman themes, sometimes copying the plot lines from classical plays (e.g.-- Comedy of Errors) or take place in Italy (e.g.-- Romeo and Juliet). However, many of Shakespeare's other plays take place in England and reflect the fact that the various nations in Northern Europe were defining their own unique cultures apart from Italian and classical influence. Ironically, one could say the most important result of the Northern Renaissance was a religious revolution. This was the result of a several factors: anger at the church's corruption, the rising power of kings at the expense of the popes, and the fusion of Renaissance ideas from Italy with the still intense religious fervor and emerging national cultures of the North. The dynamic combination of these factors would lead to the Protestant Reformation that, in turn, would branch off in three lines of development. First, the Protestant Reformation would open the way for new ideas about money and the middle class, and that would lead to the triumph of capitalism in Northern Europe. Secondly, the Protestant Reformation would play a vital role by shattering the Church's monopoly on religious truth, breaking its iron grip on scientific thinking, and paving the way for the Scientific Revolution of the late 1600's and 1700's. Third, the growing power of kings in Northern Europe, combined with Renaissance learning and local anger at Church abuses, helped pave the way for more secular theories about the state. The Reformation, by challenging the power of the Church, would also help kings in their claims to greater sovereignty through the theory of Divine Right of Kings. Ironically, the Reformation would also provide the theoretical backing for the democratic revolutions that would eventually overthrow the very monarchies that tried to use it against the Church in the first place.